Is Twitter Down...Or Is It Just You? Sign in to your account at Twitter.com. When any major web outage occurs, people tweet about it on Twitter. But if Twitter is down and inaccessible, you can’t tweet. Sometimes, it’s not Twitter's fault. 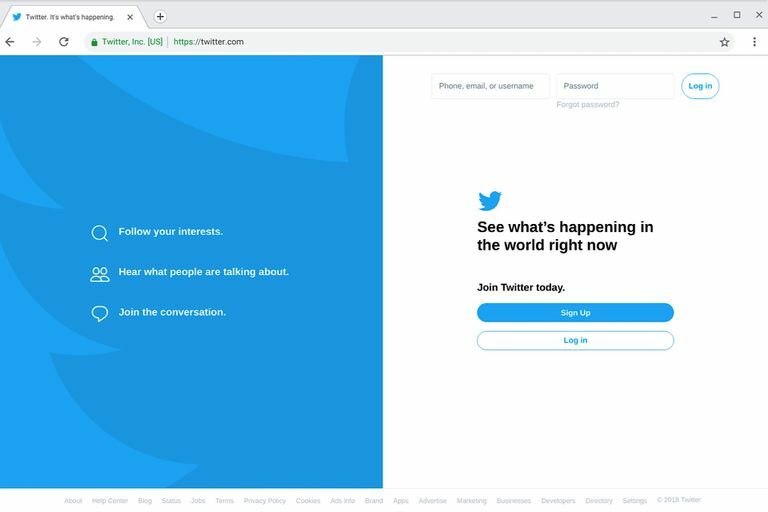 Here’s how to troubleshoot Twitter to figure out whether the problem is with Twitter, your internet connection, your device, your browser, your app, or your Twitter account. Check Twitter's status page to see if something's happened with the social media platform. If you see a message such as “service disruptions” with a recent time, there’s clearly a problem with Twitter itself. Check status.twitterstat.us to see the status of Twitter services. An “All System Operational” message may indicate your problem lies elsewhere, or Twitter has not yet recognized there’s a problem. Typically, most people access Twitter from an app or from a web browser. If one of these methods doesn’t work, try another. You might try to sign in at mobile.twitter.com in a browser. Access Twitter from your browser: Go to https://www.twitter.com. On Windows and macOS devices, this should show you the full Twitter website. On Android, iPhone and iPad devices, you’ll likely be automatically redirected to a mobile version of the site. Access the mobile version of Twitter: If you still can’t access Twitter, try to open the mobile version of Twitter at https://mobile.twitter.com. This version is also called Twitter Lite, since it uses less data and supports Twitter access when you have a slow or intermittent network connection. Official Twitter app: Install and sign in to the official Twitter app for your device. Twitter offers apps for Android, iPhone and iPad, and Windows 10 systems. The official Twitter app gives you access to Twitter without some of the limitations occasionally found in third-party Twitter apps. Tip: You also may receive and send Tweets via SMS from a mobile phone. To do this, you first need to look up your carrier’s short code, then text the word START to the short code. In the United States, for example, this is 40404. You would text START to 40404. For more details, see About Twitter SMS commands at the Twitter Help Center. If you still can’t access Twitter, you might want to turn your device off then back on. A restart sometimes fixes connection and application problems. Several types of tools block access to social media sites, and there are a few things you can look into to see if that's the problem with Twitter isn't working. Your connection to social networking sites may be blocked by network or router settings. For example, the OpenDNS service can be configured to block access to Social Networking sites. Try another social media site like Facebook or Instagram: If you can access most websites, but not social media sites, from a browser, then the problem may not be with Twitter, but instead, some sort of restriction that prevents access to social media sites. Content blocker settings: If you use a content blocker in your browser, like AdBlock Plus, Disconnect, or Ghostery, review and change the settings to allow access to Twitter.com. Firewall and Wi-Fi settings: Social media sites may be blocked by a network device configuration, such as a Wi-Fi access point or firewall. Sign in to your Wi-Fi access point, router, or firewall to review filtering settings. Different routers have different controls, but you should look for either filtering options or parental controls settings for your device. Check to see you're connected to a network by opening a browser to another major site, such as Google. If you also can’t connect to other sites, the issue may be your home network. Wi-Fi Status: Check the status of your Wi-Fi access point, router, or modem. Most network devices such as these have lights indicating a device is on, as well as connected. A red light or lack of a light may indicate a problem. Reset: As with many devices, a restart may help. Turn the devices off. If you can’t find a power switch, unplug the power cable, then turn the devices back on or plug the power back in. Wait a few minutes for the devices to reconnect to your internet provider, then try to connect to Twitter. Try a different network: You might switch to a different network, then try to connect to Twitter. For example, on an Android phone or iPhone, you might turn off Wi-Fi on your device, then try to connect to Twitter. Or, if you already had Wi-Fi off, turn Wi-Fi on, connect to a nearby access point, then attempt to access Twitter. If most of your internet access and connections work, but not Twitter, you might change your device’s DNS settings. Sometimes incomplete, inaccurate, or blocked DNS settings will prevent access to specific sites. In most cases, your internet service provider handles DNS by default, but you may often configure your device or router to use an alternative DNS provider. For example, Cloudflare, Google, OpenDNS, and Quad9 all offer free DNS services. If you can connect to Twitter, but can’t sign in, you still have a few options open to you. If necessary, you may reset your Twitter account password. Reset your password: To do this, go to the Twitter sign-in page in a browser or on the Twitter mobile app for Android or iOS and select Forgot password. To complete the password reset process, you may need access to the email account associated with your Twitter account. For additional password reset assistance, see Twitter’s How to reset a lost or forgotten password help center page. Locked account: If you, or someone else, has unsuccessfully tried to sign in a few times, Twitter might lock your account. After this happens, you’ll need to wait about an hour before attempting to sign in again. During the lockout, Twitter won’t allow you to sign in even if you do enter the correct password. Suspended account: Twitter may suspend accounts because of abusive Tweets, spammy behavior, or a potential security problem. In some cases, Twitter may allow you to unsuspend your account. If Twitter permits it, you'll see specific instructions and/or a request for additional information after you sign in. Otherwise, you may need to attempt to unlock your account or file an appeal of your suspension with Twitter.